The Youth Outdoor Skills Camp will take place from July 21 to July 30 for ages 12 to 15. The fee for the camp ranges between $465 and $570. Check out our Summer Schedule to see all program dates. 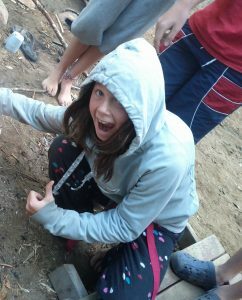 Golden Lake’s regular outdoor camp already involves wilderness skills, as well as letting you experience the outdoors and God together with a bunch of friends and counsellors. The goal of the outdoor skills camp is for you to learn useful skills and for you to grow together as a team with your friends at the camp. So while at regular outdoor camp you get a chance to learn lashing if you want, by the end of Youth Outdoor Skills camp you’ll be a lashing expert! You’ll be able to build a shelter that you could sleep under using just wood and rope. And if you have trouble learning any of the knots, you’ll have counsellors there to help you through the difficult parts. We’ll also make sure everyone is able to keep up with the learning throughout the week. The camp culminates in a three day canoe trip where you will get the chance to work as a team. You’ll be with your counsellors and lifeguards if anything goes wrong, but the focus of the trip will be on putting you in the driver’s seat to get a feel for what kind of responsibilities go into planning and executing a successful wilderness canoe trip. Throughout the camp you’ll still be learning about God and playing silly games. The major difference is the additional three days in Algonquin and the direct feedback and tutoring you will get on your skills. The curriculum will include lashing & knots, fire building, pitching a tent, finding your way in the woods, canoeing (including steering), and a session on the importance of planning to survival in any extreme situation, among others.